Abu Dhabi is located in the western side of UAE and is the biggest of the seven emirates. In the south-west region of Abu Dhabi, on the outskirts of the Rub Al Khali desert, there is Liwa, one of the biggest oasis in the Middle East and the Bedu people’s homeland. Here are to be found some of of the biggest and most beautiful dunes in the world. To reach Liwa from Abu Dhabi it takes about five hours through stunning landscapes and mesmerizing dunes. Stretching all over the southern part of the Arab Peninsula, the Rub Al Khali desert enters Saudi Arabia, UAE, Oman and Yemen with a length of 1000 kilometres and a width of 500. The extreme weather conditions make this desert inhospitable even to the ancient nomad tribes, who prefer to avoid it and take the routes on its outskirts. In summer average temperature easily gets to 60 celsius degrees, but surprisingly many kinds of birds, plants and insects adapted themselves to live here. In the so-called Empty Quarter the dunes’ heights can get up to 300 metres. 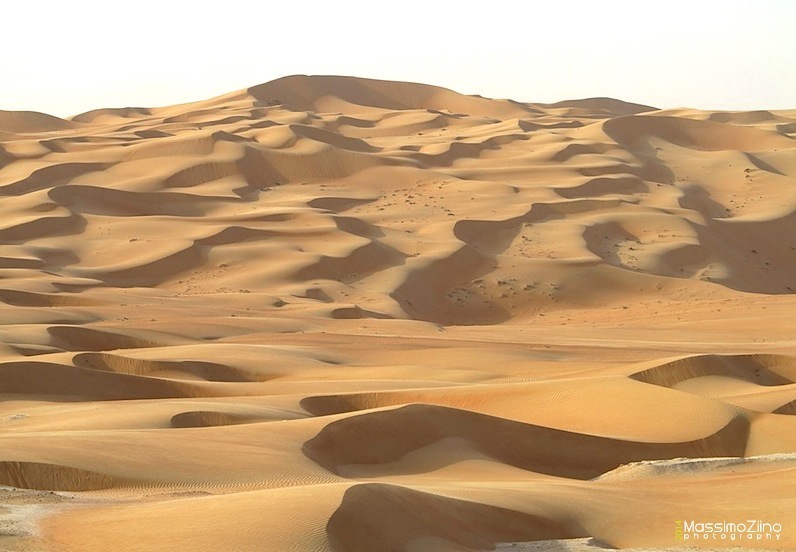 Natural resources are another main topic related to Rub Al Khali. It is believed that the desert hides the largest oil reserve in the world and among the many extraction and processing installations there is also one of the biggest gas processing installations in the world. Another interesting sight are the many dry rivers which led the researchers to think that Rub Al Khali might have been a fertile land about 40.000 years ago, when it still enjoyed the monsoon season which later moved towards India. In 2009, at the borders with the Empty Quarter, the first luxury hotel opened in the desert, Qasr Al Saeab, a five star resort located about two hours by car from Liwa and three hours from Abu Dhabi. The ever blowing wind shapes the dunes, making them amazing subjects for photos. Rain is very uncommon, instead one may jump into a sand storm which would transform the surrounding landscape in a few minutes, offering to the viewers an unmissable show. In the group of 6 photos, where is the photo taken of the middle one in the top row, looks like a city in the desert. What area is this?